Today I am chatting about the Living Proof No Frizz line! I have tried these products for over a month now and I am….HOOKED. I received the line from Living Proof to try out for the launch of their No Frizz Humidity Shield. I immediately sprayed the Humidity Shield in my hair when I received. Let me real quick explain my hair. My hair is naturally wavy/curly and extremely frizzy and coarse. The Humidity Shield is just an amazing product for after you style your hair. If you still have frizz after you style your hair or even if you don’t style your hair, this product tames the frizz. My favorite part about ALL Living Proof hair products is I neverrrrr feel product build up in my hair….I actually don’t even feel the product…it just feels like my hair! As far as the actually shampoo, conditioner, and styling cream……MIND BLOWN. Where HAVE I BEEN!? I had tried the restore shampoo and conditioner awhile back. It was ok…it wasn’t bad in my hair but it didn’t help it like it needed. The shampoo and conditioner is just purely amazing. It makes my hair feel soft and silky and touchable in the shower. This rarely happens for me. When my hair air dries….I see half the frizz I have as when I air dry my hair without this. Above is a side by side (which my good hair picture is not as great quality sorry! 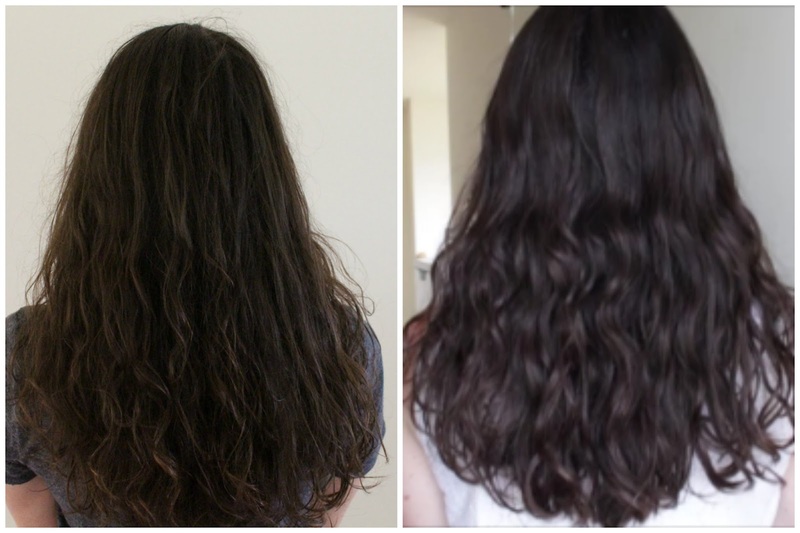 )…on the left is my hair air dry using my old shampoo and conditioner and to the right is my hair air dry with the no frizz line. My hair looks shinier, softer, more touchable….and of course less frizzy. The styling cream is amazing too. I do find if I use too much I tend to get the product build up in my hair. So less is more with this product and it does such an amazing job of prepping my hair to be styled without all my frizzies!!! So definitely check this line out especially if you have hair like me!!! Hope you all have a great day!